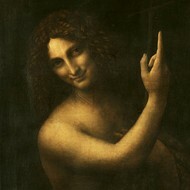 Definition,Characteristics of Renaissance Oil Painting Technique. Mona Lisa (1503-6) Louvre, Paris. In fine art, the term "sfumato" (derived from the Italian word fumo, meaning "smoke") refers to the technique of oil painting which colours or tones are blended in such a subtle manner that they melt into one another without perceptible transitions, lines or edges. Leonardo da Vinci (1452-1519) himself described sfumato as a blending of colours "without lines or borders, in the manner of smoke." It is as if a veil of smoke has been placed between the painting and the viewer, toning down the bright areas and lightening the dark ones, so as to produce a soft, imperceptible transition between the differing tones. Typically involving the use of a number of translucent glazes to create a gradual tonal spectrum from dark to light, Sfumato is classified as one of four painting modes of Renaissance art, the others being Unione, Cangiante, and Chiaroscuro. 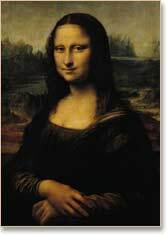 Not completely mastered until the era of High Renaissance painting, sfumato's greatest exponent was Leonardo da Vinci, as exemplified by his composition Virgin of the Rocks (1483-5, Louvre, Paris; National Gallery, London) and his world famous portrait of the Mona Lisa (c.1503, Louvre, Paris), whose facial features and smile is rendered with the type of extremely gentle shading which is so typical of this painting technique. Sfumato was also mastered by the Florentine Fra Bartolommeo (1472-1517), the Venetian painter Giorgione (1477-1510), the Emilian artist Correggio (1490-1534), and the Mannerist religious painter Federico Barocci (1526-1612) among others. For another painting method, see: Grisaille.  For related terms, see: Painting Glossary.  For more about fresco, oil and watercolour painting, see: Homepage.